Baked beans is a dish containing beans, baked (or, despite the name, usually stewed) in a sauce. Most commercial canned baked beans are made from haricot beans, also known as navy beans - a variety of Phaseolus vulgaris - and sold in a sauce. Left: Baked beans and scrambled egg on toast. A similar dish is pork and beans and bean recipes which include pork are often referred to as baked beans. In the United Kingdom, tomato sauce is most commonly used. In the U.S., Boston baked beans use pork and a sauce of molasses and are so popular the city has become known as Beantown. Maine and Quebec-style beans often use maple syrup. The beans used in the dish are all native to North America and the USA and were introduced to Italy in 1528 and France by 1547. Beans, squash and maize were grown together by Native Americans using the Three Sisters method of farming. According to alternative traditions, sailors brought cassoulet from the south of France, or the regional bean stew recipes from northern France and the Channel Islands. Most probably, a number of regional bean recipes coalesced and cross-fertilised in North America and ultimately gave rise to the baked bean culinary tradition familiar today. While many recipes today are stewed, traditionally beans were baked in a ceramic or cast-iron bean pot. Bean hole cooking as practiced in Maine's logging camps used stone-lined fire pits where the bean pots would be buried to cook overnight or longer. Canned beans (often with pork) were among the first convenience foods. Canned salt pork and beans with stewed tomatoes was supplied to the US Army during the American Civil War in the 1860s. In the United Kingdom, the term baked beans refers almost exclusively to canned beans in a tomato sauce. 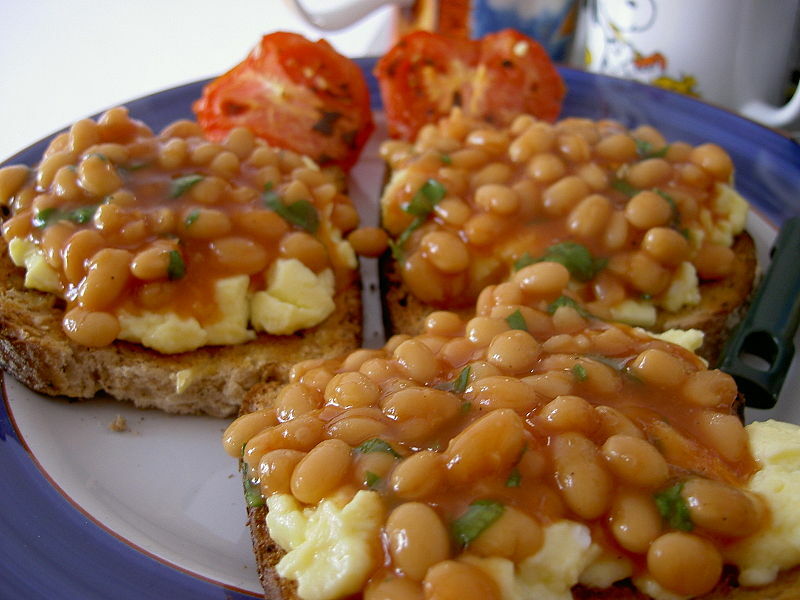 Some people regard baked beans as integral part of the modern Full English Breakfast. As the top selling brand of baked beans, historically the H. J. Heinz Company has become synonymous with them, although the growing popularity of other brands has reduced this. An estimated 95% of baked beans are consumed in the UK.